Halloween is officially one week away! This upcoming candy-filled holiday often results in your kids loading up on lots and lots of sugar. How about getting into the holiday spirit in a more nutritious way? Instead, trick your taste buds with healthy treats that won’t scare your waistline! Better yet, get into the holiday spirit in a more nutritious way by preparing healthy recipes at home together with your children! Below are 3 alternatives to the typical Halloween treats. These hauntingly healthy recipes and snacks are kid-friendly, mom-approved, and perfect to prepare at home together! And most importantly, they are just as fun to make as they are to eat! Ready to get into the kitchen and have some fun with the little ones this Halloween?! Here we go!! You can find the full recipes & download it in PDF HERE. Because kids like the idea of eating this helpless guy’s “bones”, they just may eat more veggies than usual. 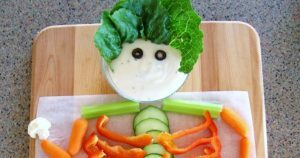 For this particular recipe, children can get involved and help in the kitchen by selecting which vegetables they want to use in the recipe, preparing all the veggies as needed, and helping make the skeleton of the veggie guy! A healthy snack with entertainment value! Add color and fun to your healthy Halloween snacks with these smiling jack-o’-lantern faces carved into navel oranges! Healthy and delicious! For this Halloween recipe, children can help you in the kitchen by shopping with you at the supermarket and selecting the different fruits to put in the jack-o-lantern cups, washing the fruit, and designing the jack-o-lantern faces! Use the watermelon and other fruit to fill and let spill out of its mouth for display. Brilliant! 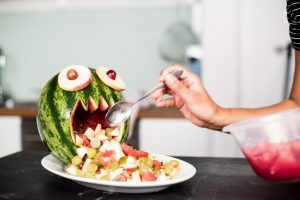 For this recipe, you and your children can work together in the kitchen by taking a family trip to the grocery store for the all of the fruits needed, cutting, slicing and dicing the fruits, and designing the face of the watermelon! These treats are so good, it’s scary! DOWNLOAD OUR EASY – HEALTHY – SCARY HALLOWEEN TREATS RECIPES! No tricks here. These healthy Halloween recipes make it more than possible to have a frightfully-fun night. As you can see, it’s not impossible to encourage healthy eating on Halloween! All you have to do is get a little creative in the kitchen with your children! Give these recipes a try for fun ways to include some healthier options! These ghoulishly good recipes are sure to get your kids excited about getting in the kitchen and eating healthy this Halloween! 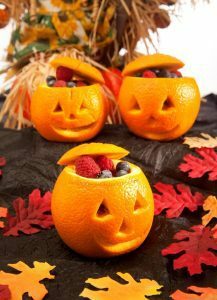 For additional healthy Halloween recipes, check out our Healthy Halloween blog! And remember, you should be eating healthy daily and not just on Halloween. If you’re looking for tips on how you and your family can eat more healthy all year round, be sure to check out our blog entry Ten Commandments for a Healthy Family Eating Routine. 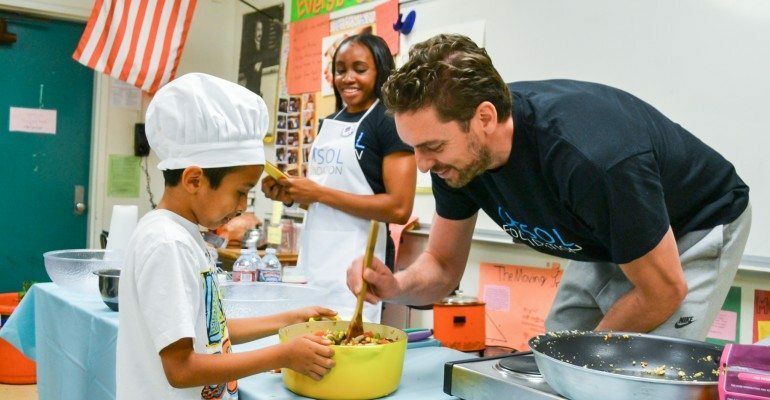 Or, if you want to learn more about why nutrition is so important, then our Good Nutrition is our Mission blog entry is for you! With these helpful and insightful blogs, you and your family will be on the path to healthy eating in no time!